Enjoy a day out in our second city, take in the sights and explore the history & dine in the best local restaurants of destination delicious! 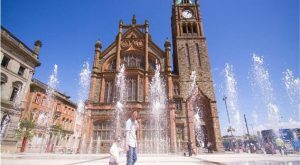 Catch the bus/train to Derry ~ Londonderry, take a short stroll to the Guild Hall. Fashioned in neo-gothic style, the Guildhall is one of the most striking buildings in the North West and was originally built in 1887 by The Honourable The Irish Society. The red sandstone building is of neo-gothic architecture, with Tudor overtones. The Guildhall contains stunning examples of stained glass windows and visitors will be intrigued by its unique history and appeal. The staircase, main hall organ and corridors give a fascinating insight into this distinctive building. 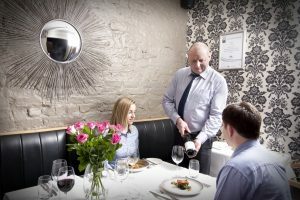 Next Stop Browns in Town (one of the “two” restaurants in the city listed in Michelin guide), situated in the heart of ‘Destination Delicious’, Browns in Town is a firm favourite with foodies who enjoy fresh local produce in a relaxed environment. 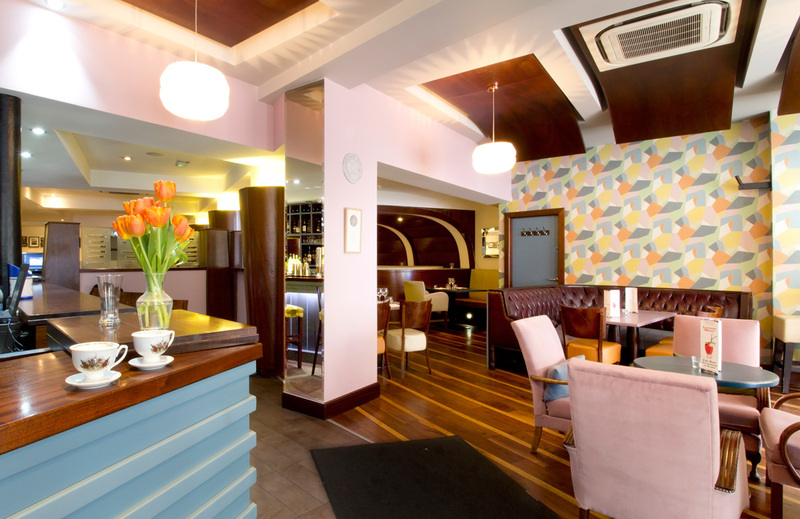 You can grab a delicious 2 course lunch for just £11.95, 3 courses £14.95 – Click for menu. The menu is perfectly complemented by original cocktail recipes and craft beers. 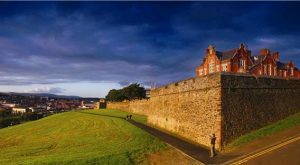 Work off that lunch with a stroll around the city walls; this is the only remaining completely walled city in Ireland and one of the finest examples of Walled Cities in Europe. The Walls were built during the period 1613-1618 by the honourable, the Irish Society as defences for early seventeenth century settlers from England and Scotland. The Walls, which are approximately 1.5km in circumference, form a walkway around the inner city and provide a unique promenade to view the layout of the original town which still preserves its Renaissance Style street plan to this day. Perfect to work up an appetite for dinner! Take a leisurely walk across the Peace Bridge, which has become an iconic structure for the city, connecting the two sides of the River Foyle. Since its launch, the bridge has been embraced by citizens and has radically changed the way people perceive the city. With over three million crossings to date, the Peace Bridge has become a focal point in city activities and events, including the New Year celebrations and launch of City of Culture year, the gateway and back drop to Radio 1’s Big Weekend, the stage for Lumière installations and several charity events such as Brides across the Bridge. Explore Ebrington Square, a public space and tourist attraction built upon the former army parade ground at Ebrington Barracks. The square opened on 14 February 2012 after a period of regeneration and hosted a number of events during the city’s time as UK City of Culture in 2013. To the west of the square, adjoining the river, is Mute Meadow, an art installation comprising 40 pairs of columns, created by Turner Prize nominee Vong Phaophanit and Claire Oboussier. At night the columns are illuminated with colours from the palette of the stained-glass used in the Guildhall windows. The changing sequence of colours is guided by a compendium of city sounds. The project has been designed to allow the public to become engaged by uploading sounds themselves. Named by Restaurants Association of Ireland for the second time in 2016, having first been awarded the accolade during Derry~Londonderry UK City of Culture in 2013. The dedicated team use the freshest local produce to create award winning menus. Listed in the 2017 Michelin Guide, Browns is open for lunch, afternoon tea & dinner. Click for menus Relax after your meal in the stylish champagne lounge for a nightcap before your return journey. 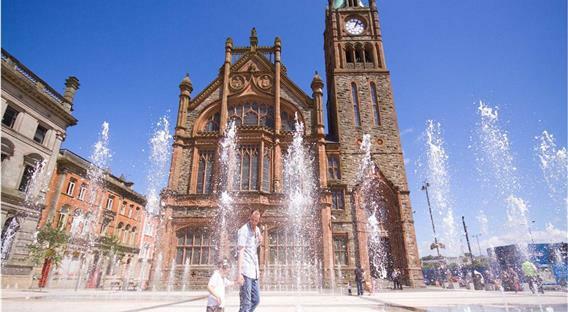 Visit Translink to plan your journey and Visit Derry for further information about the city.